Plot: Anton and Vlad are a handsome, happy couple living in modern day Russia - peacefully making a life for themselves in the comfortable privacy of their Moscow apartment. But everything is about to change. Driving home after taking a wrong turn, they confront what they believe is a vicious gay bashing. For Anton, the burden of what they may have witnessed outweighs Vlad's fear of probing too deeply into the incident. Anton talks his skeptical lover into launching their own risky amateur investigation into the hate crime, inevitably leading grim consequences. An important, topical drama Stand is both essential and gripping. I feel like I often repeat myself when reviewing DVD releases by TLA Releasing. They bring to DVD a wonderful example of a vast array of truly magical, artistic and important pieces of Gay Cinema; Cinema period. Stand is another prime example of a flawless choice to bring to DVD. Excellent in acting. The script is amazing. The chemistry and word play flow like watching strangers right in front of you. 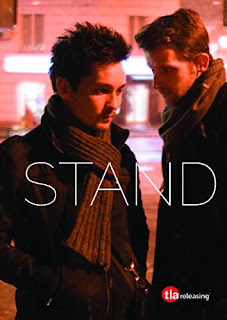 Stand is a film that is thick with drama and yet also takes the viewer on a journey of characters, and situations that the viewer feels, as emotions are displayed on screen. A tightly weaved suspenseful drama. Very intense, and most of all dramatic. What would happen if you witness a brutal gay bashing? How would you handle it? How could you come forward, knowing that the very country you live in, are against gays? That is the reality of this unique and thoughtful film. The script just bleeds perfection in this brutal idea. Two gay men witness the brutal attack. They live in Russia. Russia has a huge stance and hatred for gays. The dilemma places the two into a spiraling game of choices. What is unbelievable to me is the two main stars. Both Russian born. This being both of their first major feature film roles. Breathtaking in that idea. Both are gifted. Both create their characters in true life. Renat Shuteev plays Anton. Shuteev convinces me that he is a veteran at acting. The character of Anton is performed in an award worthy fashion that begs to be seen. Next I have to mention Andrey Kurganov who plays the character of Vlad. Another flawless performance that transcends an emotional ordeal off screen into the mind of the viewer. The whole cast comes together and works a tense story, both brutal and unnerving. The direction by Jonathan Taieb is also award worthy. This is his second directing feature film. This French director knows how to create on camera the tight excellence of a drama, mystery that begs to be seen, and remembered. This movie should be watched and discussed in conversation. Taieb is a fantastic director. This film has everything a great piece of cinema is all about. It was selected in many wonderful film festivals such as Houston GLBT Film Festival 2015, Torino Gay & Lesbian Film Festival, Mardi Gras Film Festival, Framelin: San Francisco International LGBT Film Festival, Mix Brasil, Galway Film Fleadh. It just shows you the talent and precise understanding of how great this film is. I think the Gay Community or culture itself forgets that there are places still in this world that are bigoted and brutal. I am from America, we just passed Gay Marriage, wonderful, but there are still countries that hate and are bigoted against Gays and Lesbians and Bisexuals and Transgendered. They are still fighting the fight to be free. I think this movie showcases a wonderful example, and truly heartbreaking message that those who just want to be themselves, to love freely are being hurt. Countries that shame, lock up, hurt or kill someone for being who they are, are no different than the Slave owners of the South. Are no different than Nazi Germany sending innocent people to concentration camps. Stand is a brilliant, haunting piece of cinema. Equal parts thick drama, and equal parts thick mystery, splashed with suspense. The characters are truly defined in this film. The direction along with the story, and acting create a piece of film that demands to be seen.